My Garden Grows – in a Mop Bucket?! You’ve seen my patio and know I love mixing old and new for a one of a kind look. I’m not talking about the plastic bucket I (rarely) fill with water and reluctantly swish around on my floors. Vintage. Galvanized. Fantabulous. A mop bucket planter! The buckets were found at a few different estate sales for $5 each! Even Gnomeo gives his good housekeeping seal of approval. Remember my dresser planter that started out life as a $6 thrift shop find? My indoor mop bucket just doesn’t give me the same thrill – that’s for sure! 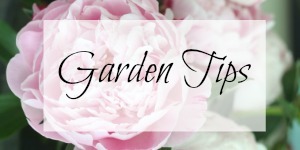 your garden is very cute in the mop buckets, kelly:) its funny, i have some planted, and never thought of them as a mop bucket, until now! Those are great. Perfect for planters. I think gnomeo looks a little dazed and confused. But happy 🙂 He looks happy! I had plans to do the same thing with my mop buckets…if it would STAY warm here. I woke up yesterday to the sight of snow on my neighbors roof! I’ll be thinking warm thoughts so you can have a mop bucket planter too! I love it! Where did you find them? Haven’t seen them anywhere. Found them at different estate sales Pat! I love just about anything galvanized. They are cool and fun and never too fussy. i love it! i think it is perfect! 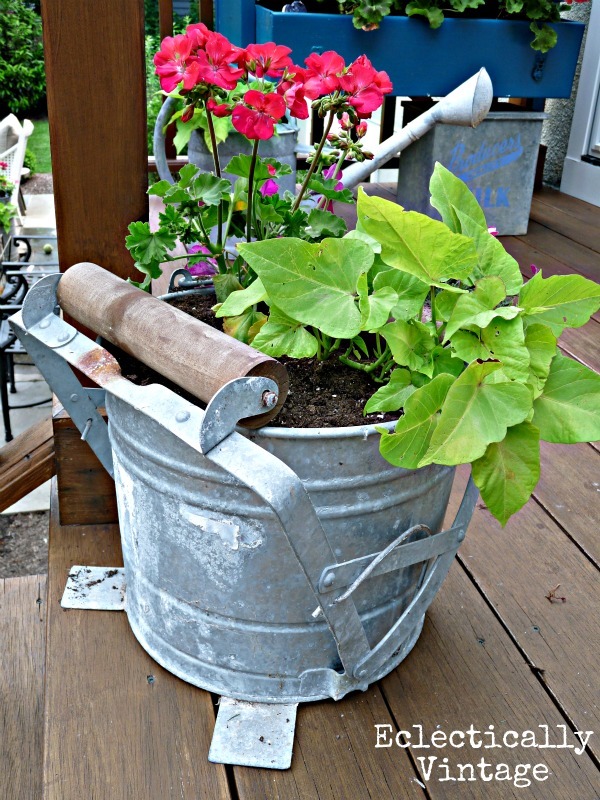 i have an old galvanized bucket for some tomato plants…. and if i had a mop bucket, i would rock it, too. i too LOVE anything galvanized. i’m in the process of replanting my hibiscus tree in a wheeled mop bucket so that i can wheel it back & forth into the house when the seasons change…found it for $16 at an antique shop, it’s huge! you’ve inspired me to replant my galv. 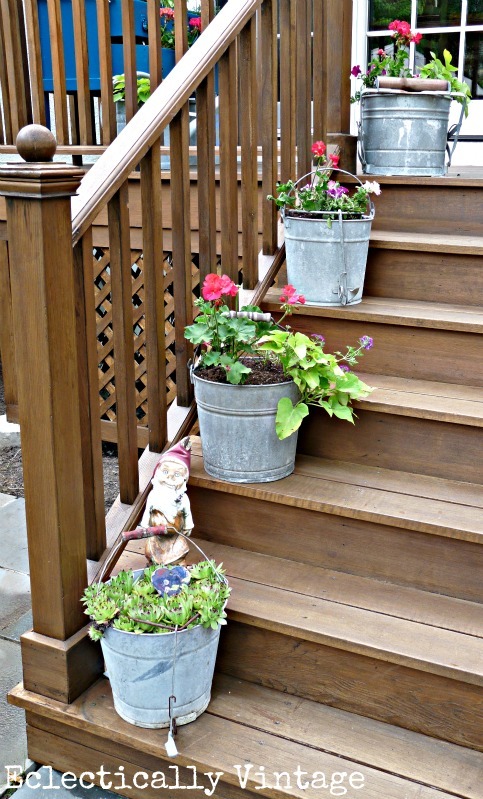 buckets that are sitting in my potting shed…as i love how it looks on your steps. something for my front to add some curb appeal. In all my “travels” I have never seen a mop bucket like that …I love it…Your porch definitely makes me smile with a giggle here and there as it is so much fun to see!! Cute! And exactly why I didn’t buy containers yesterday at the nursery. Why buy typical pots when I can have mop buckets? I love it! The mop buckets are perfect with that dresser! The little gnome is pretty awesome, too! Love the buckets. I have never seen one like that. Really cool! I love Laura’s idea of giving gnomio a little mop. And put him to work. Though your porch steps look like they’ve been swept and mopped already! Once again am amazed at your clever ideas and amazing vintage finds! 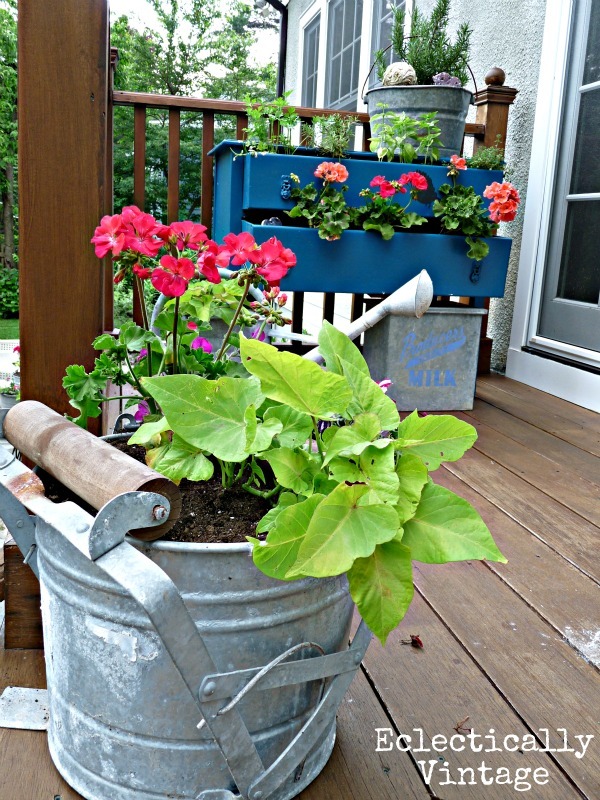 I love the idea of planting in galvanized buckets! Definitely beats actual mopping. Then again, is there anything that DOESN’T beat mopping? Maybe cleaning the shower? Where is Gnomeo’s fair Juliet? He must be lonely. I like this idea a lot! Truly proves that if it will hold something, it can be a planter. Makes climbing stairs worth the effort. I only wish I could have steps leading to a lovely landing as you have, complete with that adorable planter. The metal contrasted by the pretty floral color and softness is too sweet. Wish I could see it in person. Those are so cute. I’m all for repurposing things. Love them lined up on your steps. so adorable…love it! you are very clever, kelly!! Those mop buckets make such great planters. I’m really gathering up ideas for my front porch and I love this one. Make sure you keep an eye on the gnome, I’m not sure he can be trusted…. Love, love, love the vintage tin look of the mop buckets! They look really beautiful down the stairs like that. Kelly, last week I was just commenting on Funky Junk (I think) about my mop bucket with rollers and a long wooden handle that I used to plant red geraniums. A local garden club wanted it for a raffle so i let it go. That was several years ago and I miss it so. I love the look of a whole parade of them marching down the stairs! I guess I will have to post a picture of my urinal (from France as a joke from my brother!) planted with what else – impatiens! I love these going up the stairs, so pretty! The container mop bucket gardens are just too cute!!! And I have one of these buckets …somewhere …if I can just find it! LOL! Really like the dresser garden, too! I love them! They look great on your steps!! I am so happy I stopped in…this looks beautiful!! I love it. Great collection of galvanized buckets. Perfect for florals. Super sweet idea! I love your mop buckets. 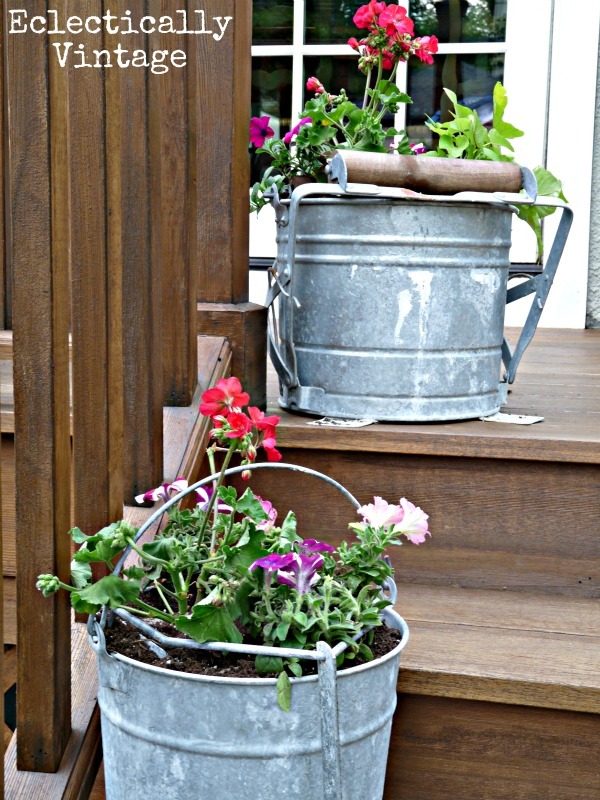 Kelly, I love the vintage galvanized buckets full of plants. They are so cute on the steps. I appreciate you linking to the OHP this week. Thanks! 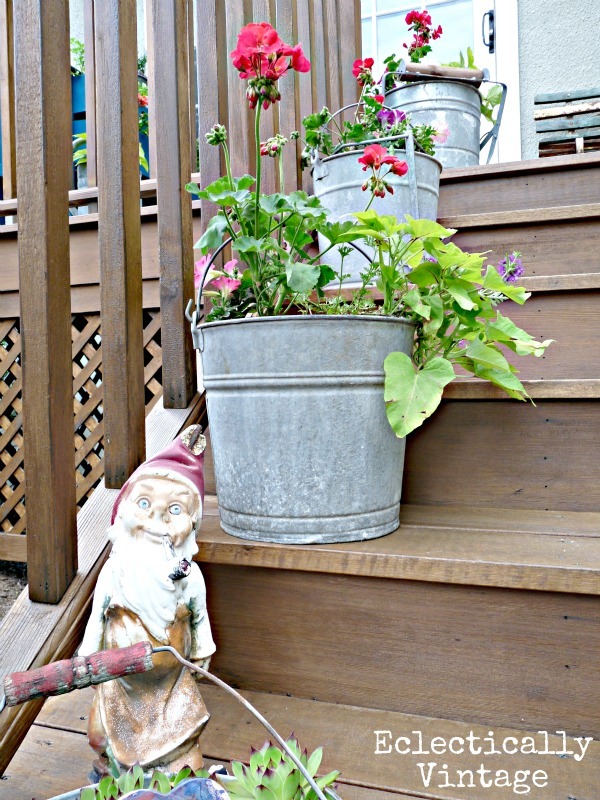 Im crazy about interesting buckets and love that you have used yours as planters. Those are awesome Kelly and i love how you have them displayed on the steps! This is the cutest idea. Looooooove it! This is such an inspirational post. Thanks so much for sharing! 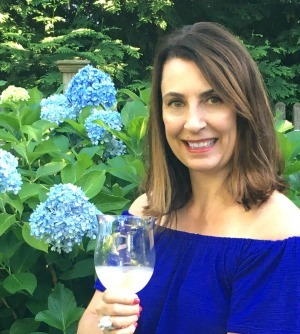 I would love it if you would link this to our WIW blog party. Hope you can join us! 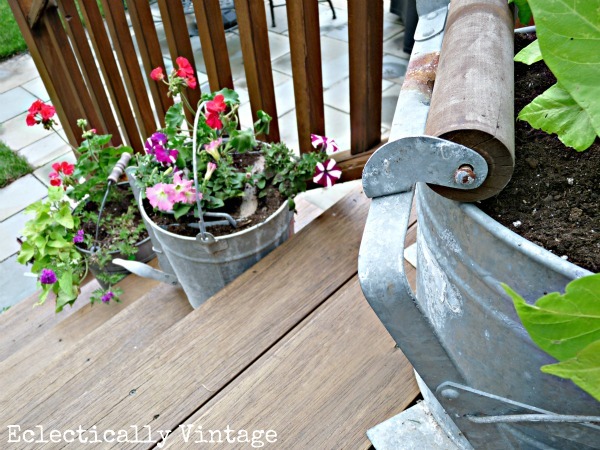 I’ve been using galvanized buckets for flower planters for years, but I drill holes in them for drainage. The mop bucket I have (just like yours!) I haven’t used because I didn’t want to “ruin” it by drilling holes, but your flowers are so pretty in it, I have to re-think its purpose! So my question is: how did you plant geraniums in your bucket? Hey, I collect galvanized mop buckets, but most of them are inside the house being used to store groceries, wood for the Franklin stove, pellets, etc. along with old washtubs, metal refrigerators/pre-fridge iceboxes, etc. Everything is metal! I have planted into galvanized pails, but not the mop buckets, as I am afraid to ruin them. Love your pics!